The Hay Loft is largest of our three lofts at about 50 square metres, with a gorgeous super-King sized bed (which can be split into two singles) and a luxurious bathroom with both a bath and a walk-in shower. The room is large with a vaulted ceiling and featuring the original truss beams. The Sitting area has a comfortable sofabed - suitable for a teenager or a couple of smaller children - a table and chairs as well as a compact Kitchen Cupboard with mini-fridge, hob and microwave. There is a Freeview TV with DVD player (and DVDs), free unlimited WiFi and a Bose Bluetooth speaker. 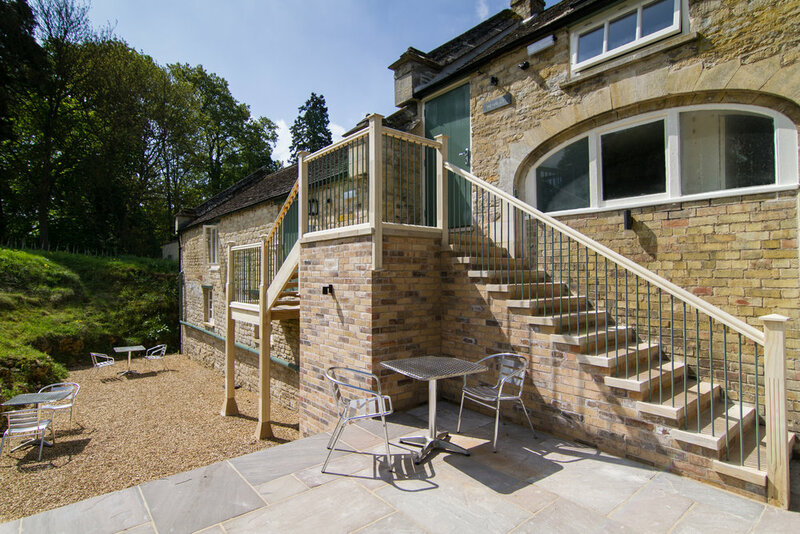 The Hay Loft has a shared sitting out area and full access to Easton Walled Gardens. All of our Lofts are dog-friendly. Due to the listed status of The Hay Loft, access is via stone steps only. A Victorian loft, part of the Stable Yard at Easton Walled Gardens, with other buildings nearby. A traditional Victorian building; there some lowish (around 6 foot) roof trusses so tall people need to take care. Access to the loft is via a stone staircase. A beautiful loft, perfect for couples - ideal for garden lovers. One small, well-behaved dog is welcome, but is only allowed in the Gardens when they are closed to Day Visitors, and shouldn't be left alone in the loft, unless they're in a cage. Unfortunately, due to the Loft’s listed status it has not been possible to make it wheelchair-friendly and as a result it is only accessible via a stone staircase.